The construction of the world’s first Hindu temples started approximately 2,000 years ago in India. Today, there are over 900 million followers of the Hindu religion, and these temples play an important role their culture and society. Most of the temples are open to tourists, and many have become popular vacation destinations because of their fascinating history and stunning architecture. In particular, the following five temples should be on any visitor’s must-see list. The Indian temple of Virupaksha, located in the city of Hampi, was constructed in the 7th century. It is one of the oldest temples in existence that is still functioning. Within the temple’s inner sanctum is a carved pinhole that creates an inverted image of the temple structure on the wall when the sun passes a certain point in the sky. Living in the temple’s courtyard is a resident elephant that happily greets all visitors. If you pay a coin to the elephant’s handler, the elephant will give you a good luck kiss on the head. Angkor Wat is a vast complex of ruins that dates back to the 9th century. 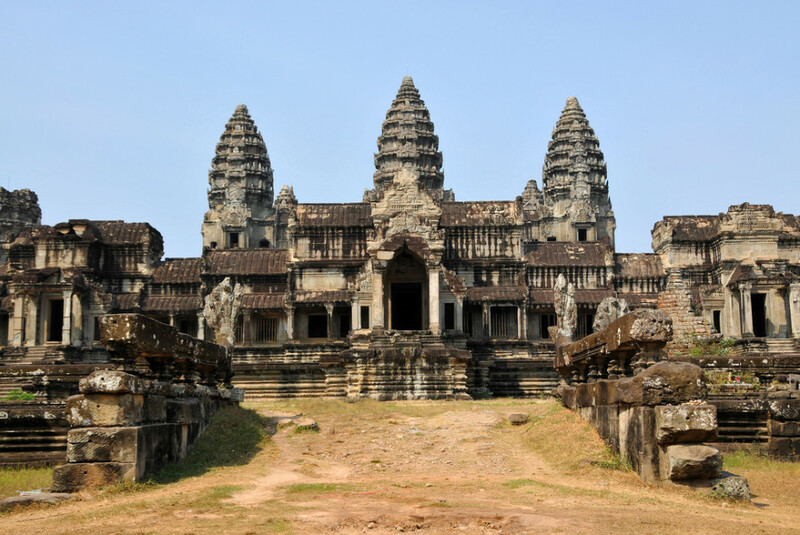 While visiting, you can tour both the Angkor Wat temple and the Bayon temple. Approximately 15 miles northeast of the official site of Angkor Wat sits the red stone Banteay Srei temple, which boasts elaborate carvings and is well worth a visit. A few of the best hotels in Cambodia are located close to Angkor Wat, such as the upscale resort hotel Angkor Resort & Spa. The hotel is in the heart of the city of Siem Reap, and is close to the airport as well as other nearby attractions. The hotel’s concierge can provide you with information on touring Angkor Wat and arrange transportation to and from the site. Every year, millions of tourists and Hindu pilgrims from around the world flock to Srirangam, India, to visit the Sri Ranganathaswamy Temple. The temple dates back to the 10th century and is one of the largest Hindu complexes in the world. After a day of touring the vast expanses of the Sri Ranganathaswamy temple complex, you might want to retreat to your hotel for a good night’s sleep. The nearby Sangam Hotel Trichy caters to temple tourists. Indonesia’s Prambanan temple complex was constructed in 850 AD and is composed of three temples: Vishnu, Brahma and Shiva. The temples’ sheer expanse and unique 154-foot central structure, which houses the three individual temples, sets the complex apart from other Hindu temples. Meenakshi Amman Temple is located in the Indian city of Madurai, and is highly significant to the Tamil people. It is constructed with 14 distinct towers and an intricately carved golden deity. The current temple was built in the early 7th century, but the complex’s history can be traced back over two thousand years. In the heart of Madurai, you can seek lodging at the Gateway Hotel Pasumalai. The hotel offers limo/town car services that you can utilize to tour the local sites. Visiting a Hindu temple is an emotionally moving experience not only because of the structure’s religious significance, but also because each one is steeped in deep historical significance. When exploring any Hindu temple, remember to dress respectfully and remove your shoes when entering the temple building. You should also always ask if it’s okay to take photo because many temples forbid pictures of the inner sanctum.